FROM THE VAULTS: This promo shot from Metro's deep filing system shows the Frontier Wives way back when. BACK IN the mid-'80s when a local indie-rock scene first began to thrive in San Jose, four indigenous crackpot dudes emerged as one of our most celebrated homegrown outfits and college-radio staples, cranking out alterno-cowpunkish rock & slop with ballsy guitar leads and loud, sweaty harmonies. Known as the Frontier Wives, their sound was dirty and fat, and their songs weaved frenzied fables about Louis Pasteur, Ace Frehley or other idols. Scott Long, who went on to work at the Knitting Factory in New York and still lives there, belted out the lead vocals and played guitar. Lex van den Berghe, of Survivor fame, pounded the skins. Saturday, the band members re-form for a one-off gig at the Blank Club, as Scott Long's Ex-Wives Club, performing some Wives hits and some covers. I recently hooked up with van den Berghe via our land lines to yak about what the San Jose music landscape was like 20 years ago. At that time, the scene was in its infancy with local bands aplenty. It seemed like everyone who had a drum set or a guitar was looking for a place to play or stay. "Bands were sprouting up left and right," van den Berghe recalls. "And the thing that was so beautiful about it, was that there was a definite sense that something new was happening here, something that we were building from the ground up—not like a bus or train that we just kinda jumped on, that was already moving—we were literally laying down what we were hoping was going to be the foundation for something that was going to live and last into the years." In those days, before the Internet, before MySpace and even before cell phones, the main sense of social networking rested with the bands and the audience. Putting on gigs and promoting yourself was almost entirely a grassroots effort, and the musicians bent over backward to support each other, much more than they do nowadays. Van den Berghe says that everyone had skin in the game and everyone had sweat equity. Road trips were difficult: "When you tried to book a tour, you were on your land line," he explained. "You were getting old issues of Maximum Rock 'n' Roll and other industry rags. ...You relied mostly on the kindness and generosity of strangers that were in the music scene. ... You were making phone calls to clubs. If you wanted to get from here to New York and back, you were at the library going through old phone books, and you were talking to people who'd been on the road already, and sharing their war stories." He concludes, "I don't think musicians today understand how good they have it, as far as this incredible wealth of information at their fingertips on the World Wide Web and the Internet." 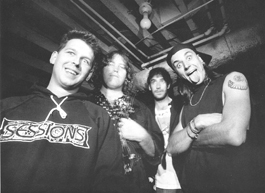 Van den Berghe, now 45, currently plays in the Maids of Honor, with Greg Camp of Smashmouth fame, and says he just wishes the bands from those days had instilled a longer-lasting effect on the current music scene, dismal as it is. "We were all working our asses off to make new music and to make a scene," he says. "And to leave some sort of legacy, a musical legacy in San Jose. And that's why it's been heartbreaking to see this languishing and falling apart. And now—it hasn't been that long, but the newer generation today, the twentysomethings, nothing's been left behind. There is no legacy. We didn't leave enough of a permanent mark, so people today know that something happened back then. It's almost like it's been erased." Unfortunately, a few weeks ago, van den Berghe shattered his arm while skateboarding to the liquor store on a beer run from the Maids' recording session, so he can't play drums for at least a few months. As a result, the status and lineup for the Wives gig was still being hammered out at presstime. "My wife says it's a classic case of a 15-year-old trapped in a 45-year-old body yet again," Lex explains.